I planned to spend all of yesterday doing schoolwork, I really did. (Just like every day until at least April 20.) But at about 1 p.m. I couldn't stand being in the house anymore. It was a beautiful day, and I just needed a break. I decided that I could justify taking the rest of the afternoon off to clear my mind, and I'm so glad that I did. Bill and I hit the road and headed north (northwest?) to the Laurentians. We hadn't been out of the city since last October, when we drove to London; we stopped in Laval for road coffees and then drove about 60 kilometres to St-Sauveur. 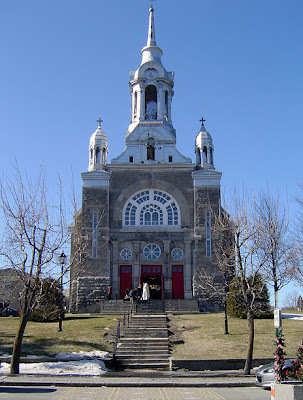 (The photo above is of L'Eglise St-Sauveur.) It's a small ski-resort town, very touristy, the sidewalks jammed with sporty people and their enormous dogs. We walked in the sunshine for a while and then got back in the car and drove another five kilometres to Morin Heights. We spent a glorious hour there having a pint on the terrasse of the local pub. I wasn't even wearing a jacket -- just a sweater and a scarf. Glorious. So, yesterday was a big breath of fresh air (literally! ), but today I'm back at my desk and back to my work. Sigh! I need to keep reminding myself that after I hand in these three papers, I can have lots of days like yesterday. fresh air. beer. yum. sounds like a great afternoon! now back to work for you! How weird! I live on Guernsey and not only do we have a parish called St Saviours (in the local patois it is caled St Sauveur)and we have hill called Mount Morin! Sounds like a great day! You need to have a day off to make other study days more productive. Looks like a good breather from schoolwork! I'm fighting the urge to spend the rest of the day outside and ignore the organic chemistry on my desk! Sounds like you had a glorious time! sometimes the brain needs a fresh air break. it looks like it helped! I'm a former Sauveur-ite and miss it so - when I saw the Church, I nearly plotzed. I recognised it before I read what your post was about!! !